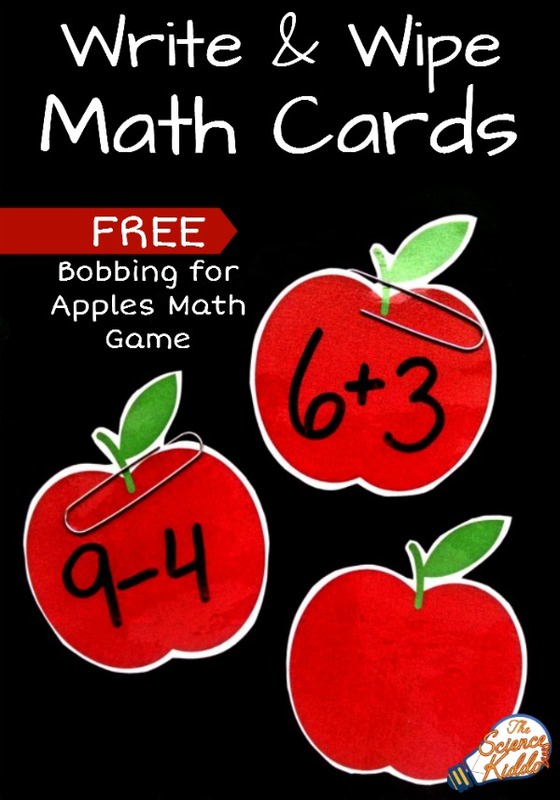 Make your own bobbing for apples math game using these free write and wipe math cards. Great for use practicing math facts, sight words, spelling, and more! With summer coming to an end and back-to-school season upon us we are setting our sights to autumn, pumpkins, apples, and cooler weather. 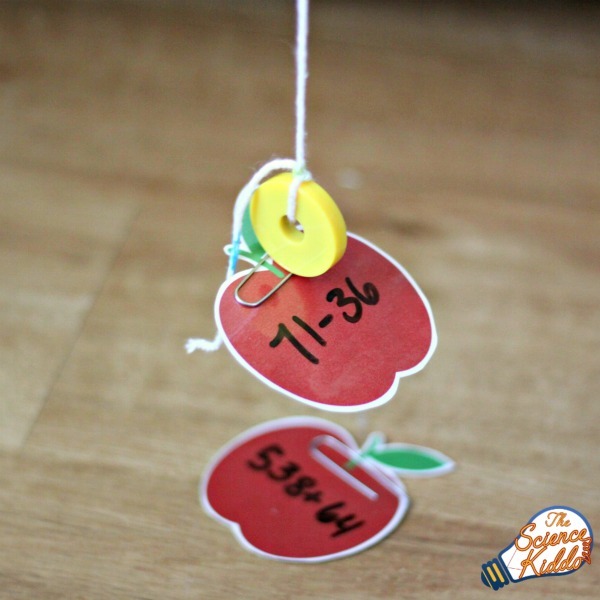 Today we spiced up our homeschool with this fun bobbing for apples activity using write and wipe math cards. 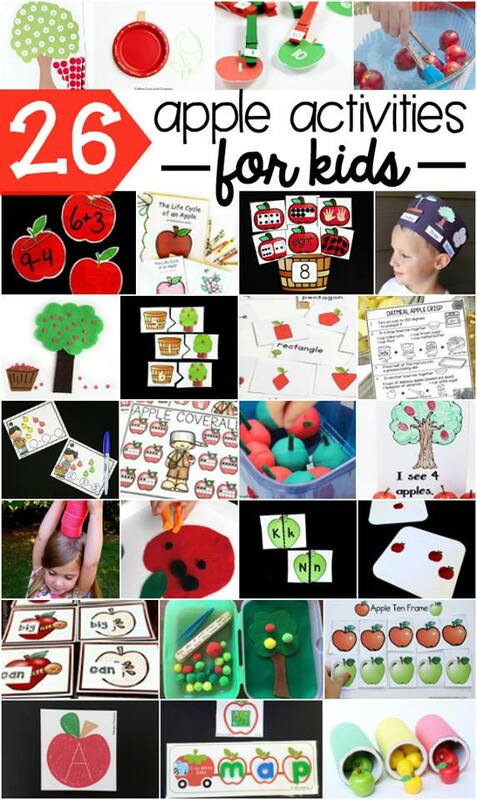 At the end of this post you can print out your own free set, plus get 25 more apple-themed educational activities! 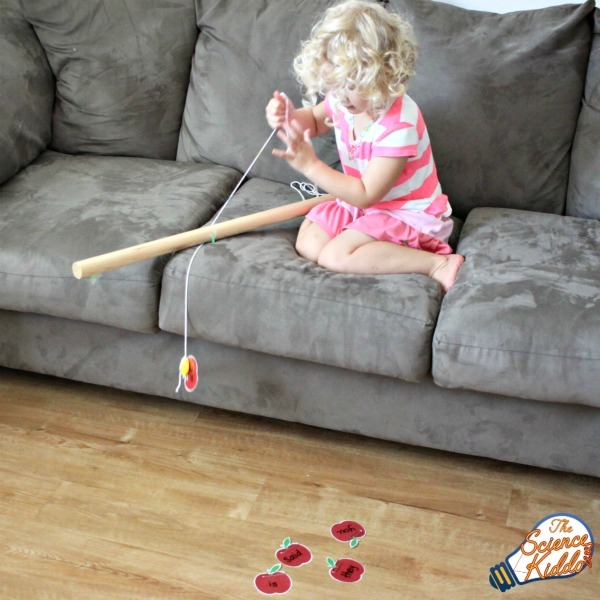 This activity is so simple, yet so fun. My kids were literally jumping up and down as they caught their apples and waited for their next turn. All you need to do is scroll below to print out your own free set of apples. Feel free to print out as many sets as you need. Laminate the apples (click here to see the laminator I own) and cut them out. Place a metal paper clip on each apple card. 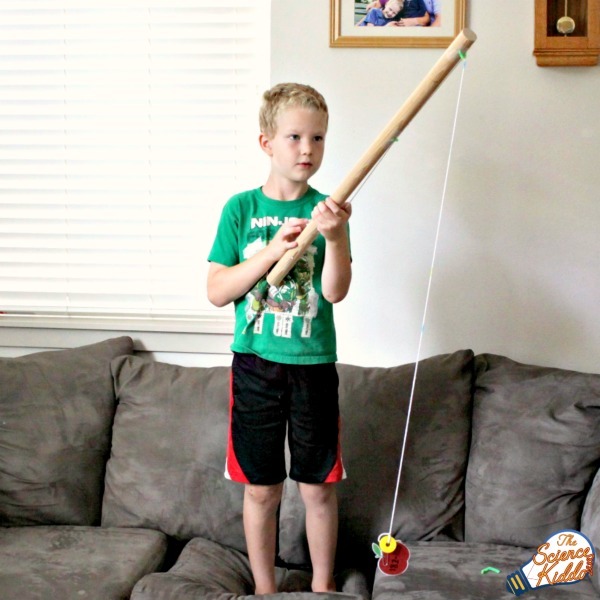 Use a magnet and string to fashion some kind of fishing rod. We used a ring magnet tied to some yarn that was attached to a closet pole. You could also tie some yarn to a stick or a coat hanger and attach the magnet to the other side. Anything will work! Use a dry erase marker to write a math fact on each one according to the level of your students. My seven-year-old is working on 3-digit addition and subtraction while my four-year-old is doing addition and subtraction up to 20. We did six apples for my son, erased his math facts, and then did six for my daughter. They loved it! Each time my kids caught an apple they had to study the math problem and answer it correctly before they could catch another apple card. They had a blast and I was happy because they were learning, too! 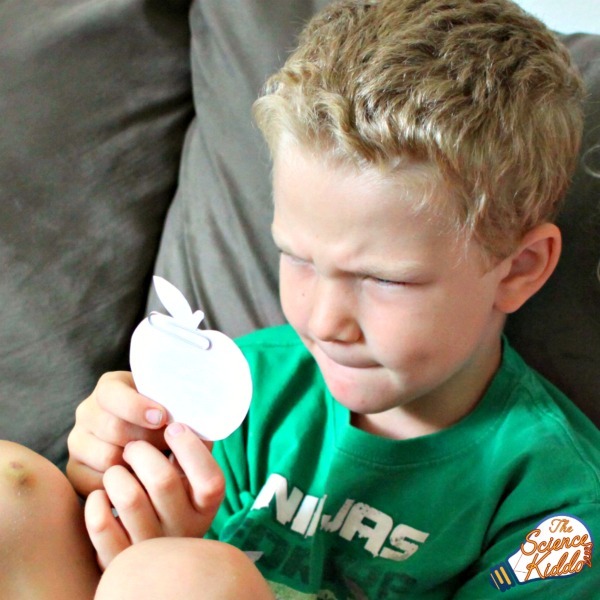 If your kids are like mine and really thrive with hands-on learning, check out this other fun fall STEM activity where the kids will paint rocks to look like apples and learn a ton of cool science along the way! I love activities where I get a lot of bang for my buck, just like you do. These write and wipe math cards really fit the bill! They are reusable in hundreds of different ways. You can use them for math practice, sight words practice, spelling practice, and review just about anything else! My four-year-old played a round of bobbing for sight words. Each time she caught an apple she read the word and then went bobbing for a new one. 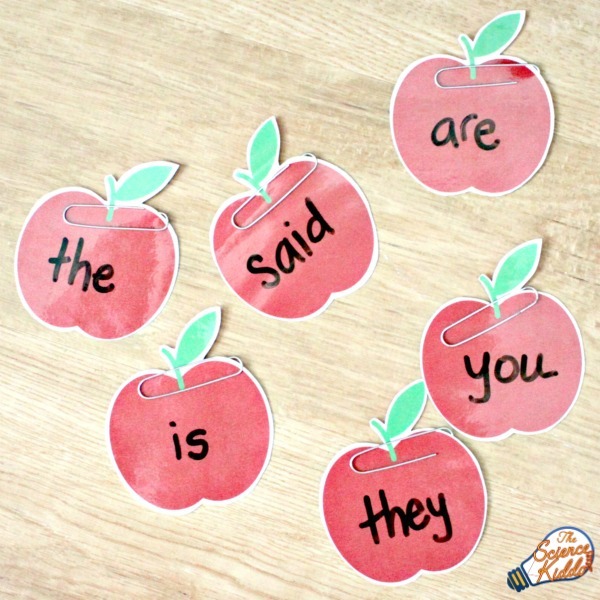 Click below to print out your free set and enjoy bobbing for apples!